Brief Synopsis – A British bookshop owner meets a famous movie star and they slowly fall in love. My Take on it – I really like the premise of this movie. To explore a topic rarely touched upon in rom-coms like this; the dynamic of a famous person and an “ordinary” person falling in love is a great idea. This is obviously something that obviously happens quite often in the real world, but we as the viewer rarely get to see this dynamic at work. What they do here is explore how friends from both sides (famous/ordinary) react to this kind of situation and the outcomes are both heart-warming, heart-wrenching and also hilarious. 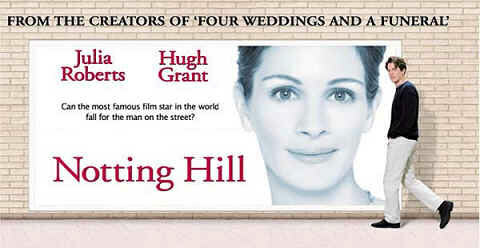 The choice of Julia Roberts and Hugh Grant as the stars was a great choice since they both fit the profiles of their characters very well. This IMHO is one of Grant’s best movies. Bottom Line – Great rom-com with a very interesting premise. Definitely one of Grant’s best movies.